In a large pot, heat the olive oil. Add the onions and cook for about 5 minutes or until they are soft and translucent. Do not let them brown. Add the cauliflower, spices and broth. Bring broth to a boil, stirring occasionally. Reduce to a simmer and cook 20-30 minutes or until the cauliflower is tender and easily cut, stirring occasionally. The broth will not totally cover the cauliflower but don't worry- stirring will be enough to ensure the caulflower cooks through. Meanwhile, bring some water to a boil. Add the broccoli, celery and potato and cook until fork tender. Drain and set aside. Using a regular blender or immersion blender, blend the cauliflower mixture until smooth. If you are using a regular blender, you will have to do this in steps, pour the blended soup in to another large pot as you go. If using an immersion blender, you can blend the soup right in the same pot. 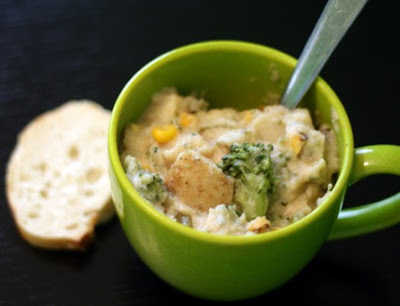 Once blended, add the milk, potatoes, corn and broccoli. Return to heat and allow to simmer another 5 minutes or until thoroughly heated. Stir and serve. Note: If a large amount of broth evaporated (if the cauliflower looks virtually dry)you might want to add about 1/2 cup of broth to the mixture after blending. You don't want the cauliflower base to be too thick. Chowder tradionally has some sort of seafood in it and a heavy, creamy base but I decided to go in a slightly different route and lighten it up by using cauliflower puree and just a touch of milk. The inspiration was the Winter White Cauliflower Soup I created a while back. That soup was a suprise hit-rich and creamy without a lot of fat and not too overtly cauliflowery. I didn't want to make the same thing over again so I thought: chowder! The base is still a creamy cauliflower (seriously, no one can ever guess it was cauliflower in the soup!) but I've added some vegetables to round it out. What I love is that even though it is vegetable-heavy it isn't heavy or vegetal tasting just really homey and comforting.